The Wrapping Paper Co. (Wrapco) is Australia’s leading designer and manufacturer of wrapping paper and accessories for complimentary gift wrapping. We are dedicated to keeping ethical manufacturing jobs in Australia. To cease manufacturing giftwrap in Australia gives greater market share to importers whose suppliers may not care about their environmental impact. Whilst customer demand exists, the importing of gift wrap into Australia will not cease and for this reason Wrapco will also continue manufacturing gift wrapping products here in Australia. What is Wrapco doing about our environmental impact? We care about the environment and fully understand the environmental impact that manufacturing our gift wrap products can cause. As such we have implemented numerous policies and procedures to lower our environmental footprint. • 2010 Wrapco became an inaugral investor in Hepburn Wind, a community owned windfarm in Daylesford, Victoria. • 2014 Wrapco installed a 60 Kw Solar system onto the roof of our manufacturing plant. This system provides 100% of all the power that Wrapco uses however not always at the same time as when we use the power. 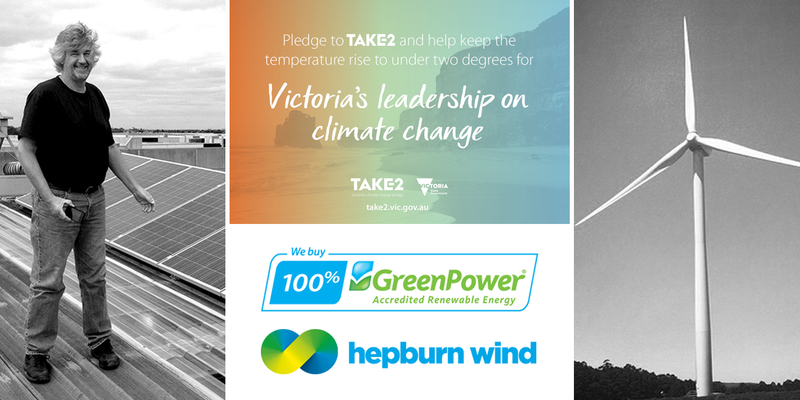 • 2016 Wrapco signed the Victorian Government Take2 pledge and became a founding partner in Take2. • Wrapco uses 100% Greenpower accredited wind energy supplied by Powershop to supplement our power usage. Ranked Australia’s greenest power company by Greenpeace for two years running and backed by Meridian Energy, Australasia's largest 100% renewable generator, Powershop is a modern electricity provider passionate about the future of renewable energy in Australia. For more information visit www.greenpower.gov.au. • Wrapco uses natural gas to dry printed gift wrap. • All products manufactured by Wrapco are 100% recyclable. • Materials used in product manufacturing are sourced from accredited paper mills supplying international Chain of Custody certified paper products. • Recycled content of paper stock is a minimum 30% and may be up to 100% of total content. • All inks used in manufacturing are either water based or ethanol solvent based manufactured in Australia. • All inks used do not contain heavy metals or other chemicals that may harm the environment. • Wrapco’s manufacturing process, utilises 99% of all materials appropriated. All waste is recycled. • Paper waste is recycled via Visy recycling. • Ink waste is refined into clean solvent and residue ink solids, which are then incinerated. This is all undertaken by an EPA controlled industrial waste disposal company. • All goods shipped by Wrapco are packed in recycled cardboard cartons and protected by stuffing from our own paper waste. • Wrapco uses Australia Post to deliver its products Australia wide. Australia Post has put in place an Environment Management System, which focuses on the environmental impacts of everyday operations. AusPost is also a signatory to the Federal Government's Greenhouse Challenge program, National Packaging Covenant and Buy Recycled Alliance. • All Wrapco staff are regularly informed about the environmental impact of our manufacturing process and the impact of the waste that they may create if they are not careful. • Wrapco has installed LED lighting throughout the whole manufacturing and office complex. • Wrapco has installed a leading edge, energy efficient air compression system. • Wrapco has replaced outdated air conditioning systems with the latest energy efficient, split systems, in our office complex. • Wrapco will implement 100% Electricity balance loading thereby reducing further the total amount of electricity used. Wrapco produces a 100% environmentally sound product here in Australia. Wrapco is dedicated to keeping design and manufacturing jobs here in Australia. Wrapco always considers what impact any new product will have on the environment, this determines if the product is to be introduced to the gift wrap market. What plans has Wrapco for future environmental impact reduction? • Wrapco is currently sourcing accredited carbon offsets to create a zero carbon footprint in our solvent and gas useage. • Wrapco is researching the future installation of storage batteries to store energy created by our solar system.